"IMPROVED LEVER". 3 7/8" high x 2 1/2" wide x 11/16" deep excluding dust guard x 7/8" deep including dust guard. Steel case. Steel shackle. Mfg by: British manufacturer. "THE INDEPENDENT LOCK CO. LEOMINSTER MASS U. S. A.". 2" wide. Steel case. Steel shackle. 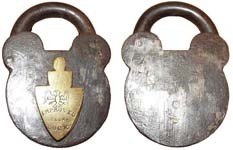 Mfg by: Independent Lock Co.
Indian. 3 3/16" high x 2" wide x 1/2" deep. Stamped steel case. Steel shackle. Mfg by: Corbin Cabinet Lock Co. US Patent #D39745. There are numerous variations of this design some of which are not made by Corbin. Indian. 2 1/16" wide. Stamped steel case. Steel shackle. Mfg by: Miller Lock Co.
"INVINCIBLE". 1 3/4" wide. Stamped steel case. Steel shackle. Mfg by: Corbin Cabinet Lock Co.